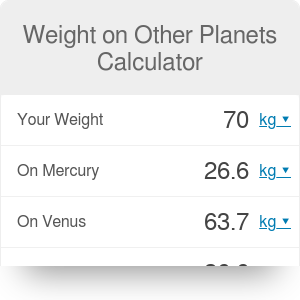 With weight on other planets calculator you might check how much you'd weight if you landed on another planet within a Solar system. One day we will be able to travel around Solar System just like we travel abroad now. What will change however (except travel costs and time!) will be our weight on particular planets. Depending where we land, we might weight only a small fraction of what we weight on Earth. Or if we choose to fly to Jupiter we might get depressed and consider ourselves suddenly well overweight. Those will be some exciting times. Our calculator can help you quickly figure out how much would you weight on particular planets around Solar System (although Pluto is not considered a planet anymore, we included it here as we weight very very little over there). Just insert your weight in any unit and the tool will automatically return results for any other planet. Differences are caused by gravitational forces on each of the planet. Formulas are strictly based on Newton's Gravitational Law and the equation F = G * ((M * m) / r^2) where F = gravitational forces, G is Gravitational Constant, M equals planet mass while m is your mass and finally r is planet radius. Weight on Other Planets can be embedded on your website to enrich the content you wrote and make it easier for your visitors to understand your message.